Although the undecided rates remained about constant beween the two surveys, the familiarity of major candidates increased. A placebo name was included in the questionnaire, but is not listed here. METHODOLOGY: Two surveys of 400 live telephone interviews of likely Oregon 2016 General election voters each were conducted October 3-6 and October 17-21, 2016. Likelihood was determined based on modeling and was validated within the questionnaire. The margin of error at the sample median is 5%. 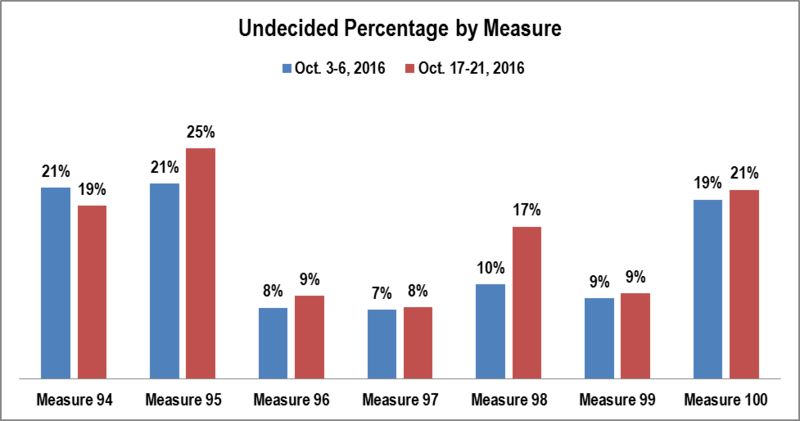 As with the candidate contests, there has been little movement in the undecided percentages for the measures. QUESTIONS: Now, I would like to talk to you about some measures that will be on the November ballot. If the election were held today on ________________, would you vote yes or no? IF YES/NO: Is that strongly or somewhat? IF DON’T KNOW: Which way do you lean? 2. Measure 95 Amends Constitution: Allows investments in equities by public universities to reduce financial risk and increase investments to benefit students. 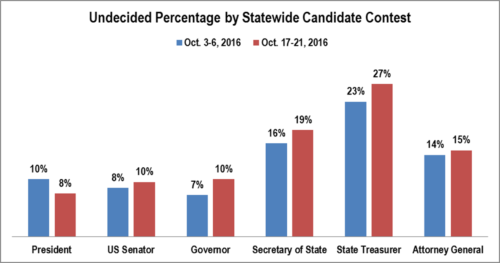 METHODOLOGY: Two surveys of 400 live telephone interviews of likely Oregon 2016 General election voters each were conducted October 3-6 and October 17-21, 2016. Likelihood was determined based on modeling and was validated within the questionnaire. The margin of error at the sample median is 7%. The relative sizes of undecided voters follows than standard pattern noted last week. 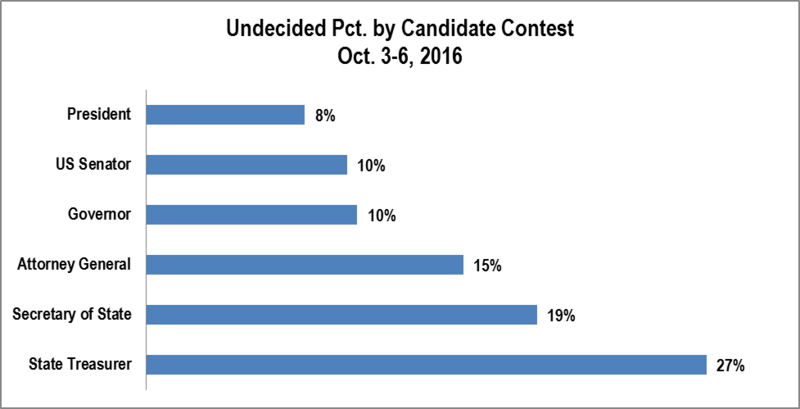 There has been negligible reduction in undecided in the candidate contests between the two surveys. In other words, voters haven’t been doing much and were waiting for their ballots. 1. If the election for President and Vice President were held today, would you vote for Donald J Trump and Mike Pence, Republican, or Hillary Clinton and Tim Kaine, Democrat, or Jill Stein and Ajamu Baraka , Pacific Green, Progressive, or Gary Johnson and William Weld, Libertarian? 2. If the election for United States Senator were held today, would you vote for Steven C Reynolds, Independent, or Ron Wyden, Democrat, or Mark Callahan, Republican, or Eric Navickas, Pacific Green, Progressive, or Shanti S Lewallen Working Families? 3. If the election for Governor were held today, would you vote for James Foster, Libertarian, or Kate Brown, Democrat, Working Families, or Cliff Thomason, Independent, or Aaron Donald Auer, Constitution, or Bud Pierce, Republican? 4. If the election for Secretary of State were held today, would you vote for Dennis Richardson, Republican, or Paul Damian Wells, Independent, or Brad Avakian, Democrat, Working Families, Progressive, or Alan Zundel, Pacific Green? 5. If the election for State Treasurer were held today, would you vote for Chris Henry, Progressive, Pacific Green, or Tobias Read, Democrat, or Jeff Gudman, Republican, or Chris Telfer, Independent? 6. If the election for Attorney General were held today, would you vote for Ellen Rosenblum, Democrat, Independent, Working Families, or Daniel Zene Crowe, Republican? 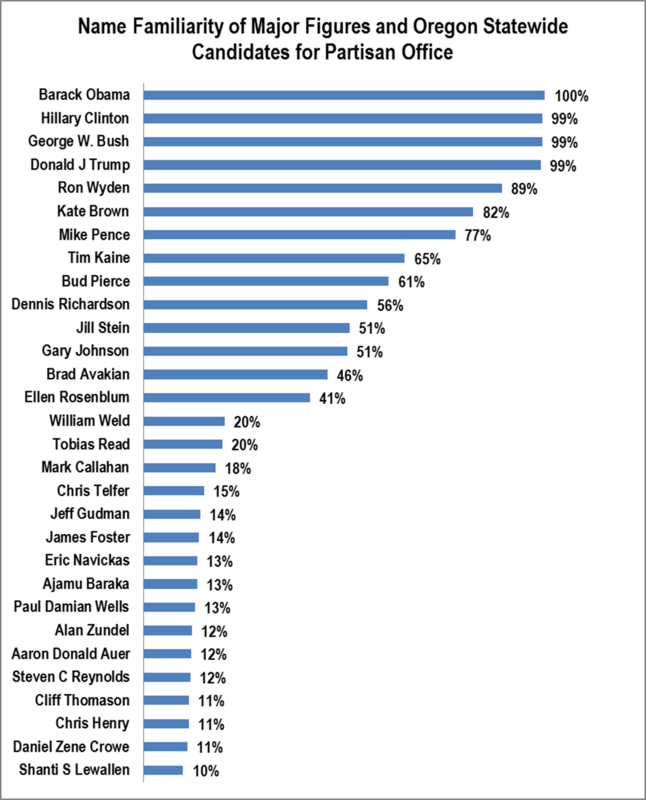 This graphic lists the name familiarity by candidate. The general order follows as one would expect. METHODOLOGY: 400 live telephone interviews of likely Oregon 2016 General election voters were conducted October 3-6, 2016. Likelihood was determined based on modeling and was validated within the questionnaire. The margin of error at the sample median is 5%. In general, the undecided is lower the more prominent the measure or the more of a “no-brainer” the decision is. 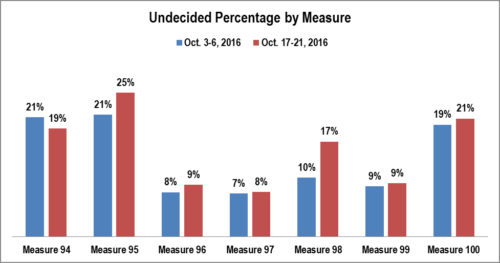 Clearly, Measure 97 should be no surprise given the amount of coverage and the level of campaign spending to date. 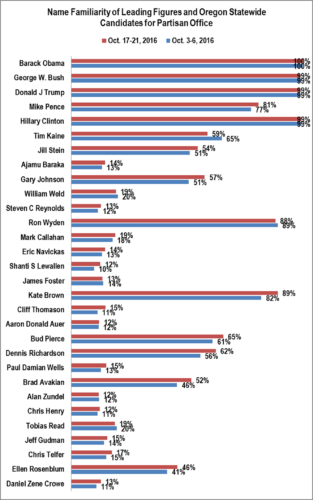 This graphic displays the undecided vote by contest. 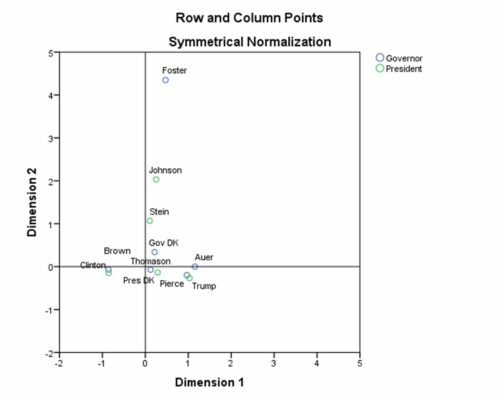 The general rule is that the undecided is smaller the more prominent the contest, the less complicated the contest (as in two-way versus three-way), and if there is an incumbent running. The last point accounts for the small undecided in the Attorney General contest. 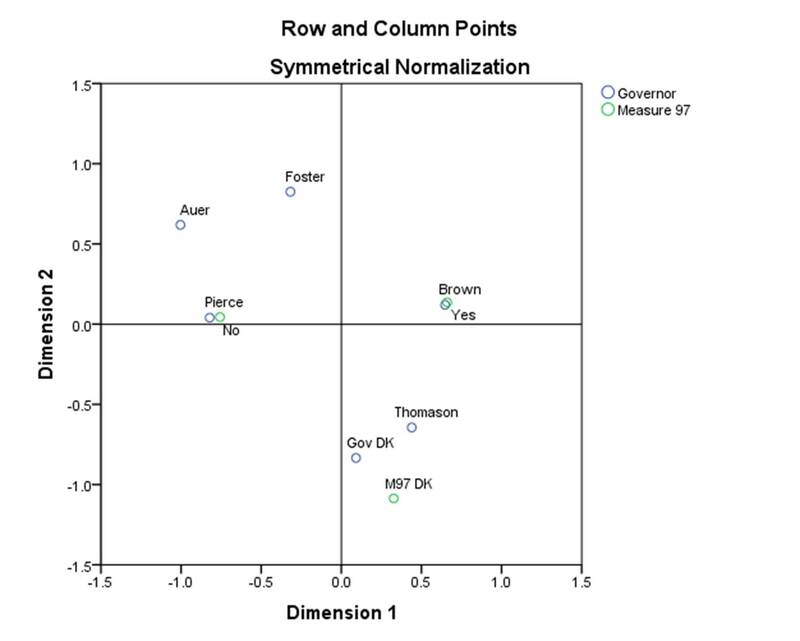 There is an even closer partisan link with Measure 97 positions among the major party gubernatorial nominees than among the major party presidential nominees. If the election for Governor were held today, would you vote for James Foster, Libertarian, or Kate Brown, Democrat, Working Families, or Cliff Thomason, Independent, or Aaron Donald Auer, Constitution, or Bud Pierce, Republican? I would like to talk to you about some measures that will be on the November ballot. If the election were held today on Measure 97 Increases corporate minimum tax when sales exceed $25 million; funds education, healthcare, senior services, would you vote yes or no? SAMPLING METHODOLOGY: 400 live telephone interviews of likely Oregon 2016 General election voters were conducted October 3-6, 2016. Likelihood was determined based on modeling and was validated within the questionnaire. The margin of error at the sample median is 7%. 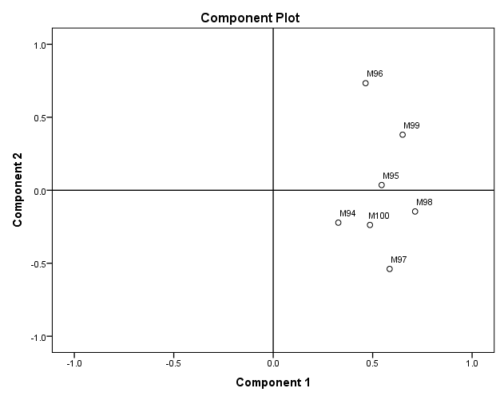 STATISTICAL METHODOLOGY: Correspondence Analysis can be seen as a visual version of a crosstabulation. It represents in distance the similarity between responses from two questions. Responses along the same angle tend to be similar. 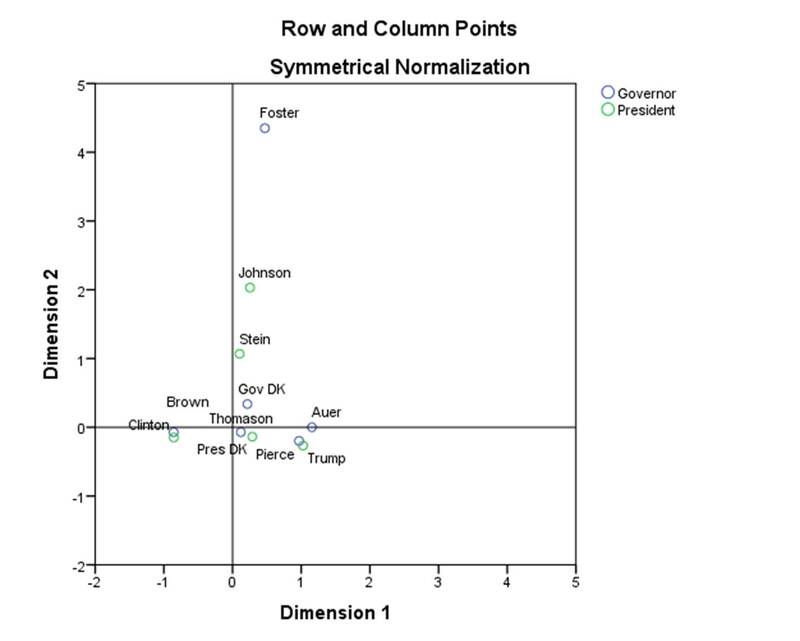 The closer to the center of the graphic the closer to the median of the electorate. 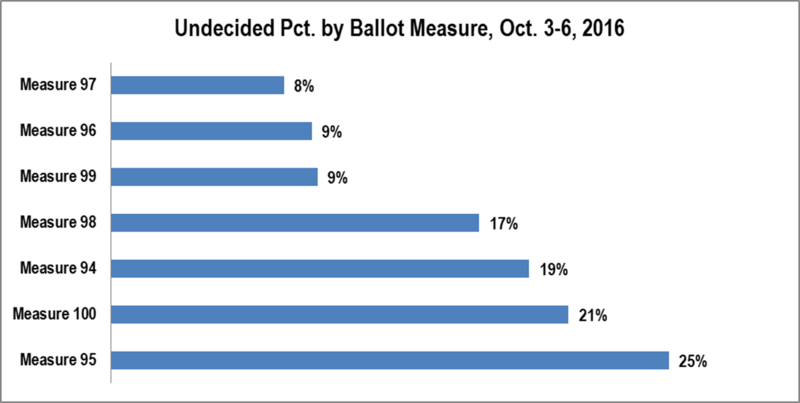 Support and opposition for Measure 97 has clear and predictable partisan division. 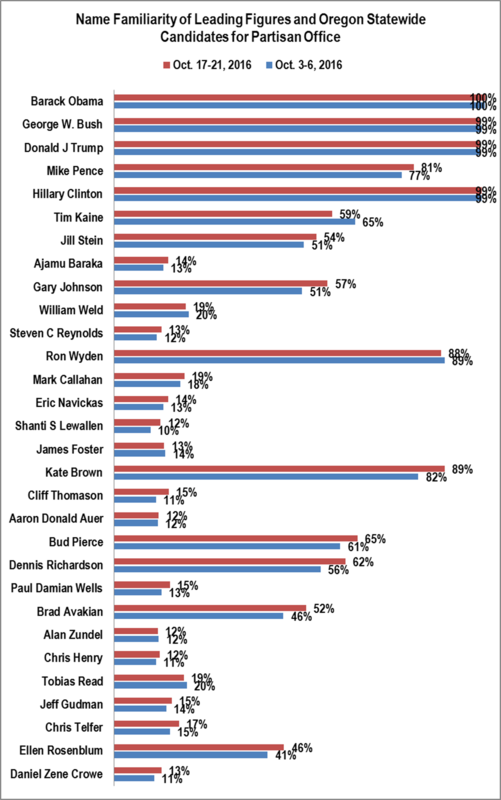 If the election for President and Vice President were held today, would you vote for Donald J Trump and Mike Pence, Republican, or Hillary Clinton and Tim Kaine, Democrat, or Jill Stein and Ajamu Baraka , Pacific Green, Progressive, or Gary Johnson and William Weld, Libertarian? SAMPLING METHODOLOGY: 400 live telephone interviews of likely Oregon 2016 General election voters were conducted October 3-6, 2016. Likelihood was determined based on modeling and was validated within the questionnaire. The margin of error at the sample median is 5%. The graphic shows the importance of partisan labels. 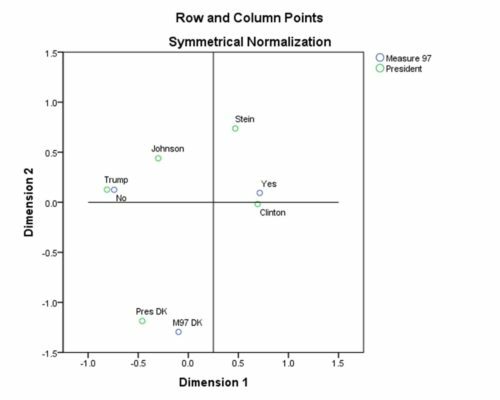 Clinton and Brown are practically the same to voters. Similarly, Trump and Pierce are practically the same. However, Johnson has successfully expanded his support beyond the standard Libertarian base – not how far away from the center Foster, the Libertarian gubernatorial nominee, is. 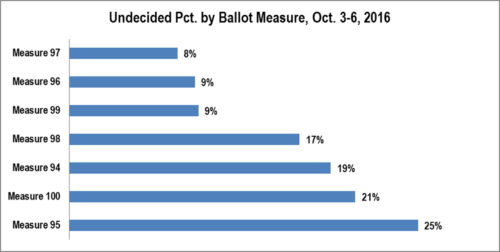 This graphic shows the voters’ perceptions of the seven ballot measures. In general, the more conservative measures are on top and the more liberal measures are on the bottom. 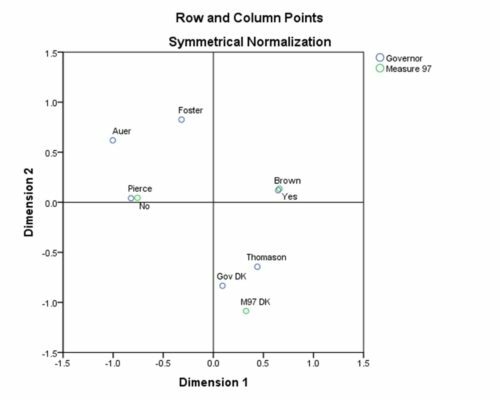 STATISTICAL METHODOLOGY – PERCEPTUAL MAP: The perceptual map was constructed using factor analysis. 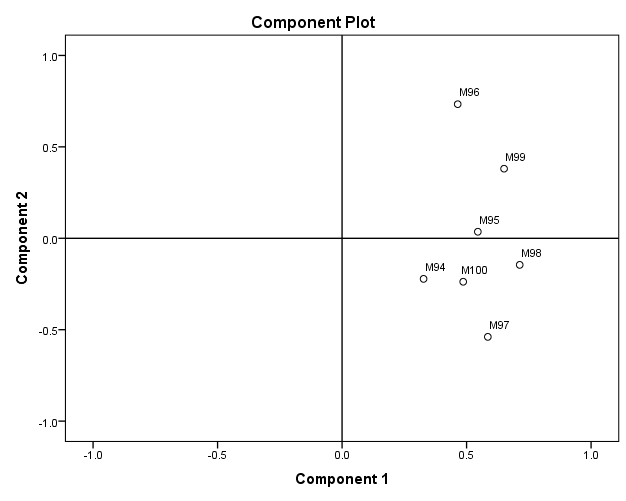 Technically, it a Principal Components Analysis was used with unrotated factors. A seven-point scale for each of the questions was used. Factors were deemed significant if their eigenvalue was greater than one. This methodology was used because it involved the least number of assumptions and, in that sense, was the “purest” way to obtain the results. There are more sophisticated methods that would arguably be more illuminating. The objective here was lack of bias and transparency.